Erik Kessels is best known for his running series of books In Almost Every Picture in which he collects found amateur photography, creating unique, and often bizarre collections, to be published in one book. His latest project. an installation on display at Foam in Amsterdam, gives visitors the opportunity to grasp the immense scale of just how many photos are shared on just one site, in this case Flickr, on a daily basis. The installation consists of rooms filled with all of the printed photos uploaded to Flickr in a 24 hour period, which translates into over one million photos. The mountain of photos, even seen in a photograph, is a great reminder of the volume of information and data that is being shared on the Internet every day. We know that there are over 6 billion photos on Flickr at the moment, and to make matters even more mindboggling, that exact same number of photos are uploaded to Facebook every 2 months. 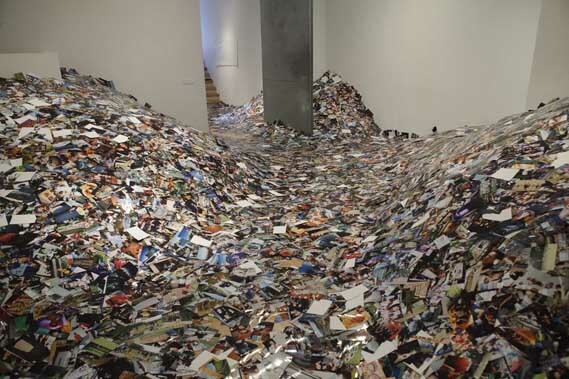 Looking at the images from Kessels’ installation really puts that number in perspective. The installation is a thought provoking vision on several different levels. Most importantly, it highlights just how much personal information we share online, visible to anyone anywhere in the world, but confronted with the idea that the printed photo exists in a room somewhere without our direct knowledge – it becomes an uncomfortable feeling. Some people have also questioned whether or not Kessels cleared copyright permissions for the million photos, and their use without consent certainly seems like a copyright infringement. What do you think? Let us know in the comments.